The husband of the Secretary of State – who is currently dealing with the American response to unrest in North Aftica and the Middle East – told the attendees that biofuels can affect the political arena by causing food prices to climb. Specifically, he said, "We have to become energy independent but we don't want to do it at the expense of food riots." He also said that the U.S. needs to "make intelligent decisions with three- to five-year time horizons based on the best evidence we have to maximize the availability of good food at affordable prices." The direct connection between large-scale biofuel production and political turmoil didn't sit well with some in the audience. The Renewable Fuels Association's Matt Hartwig responded by saing, "The driver behind rising food prices has been and remains oil. 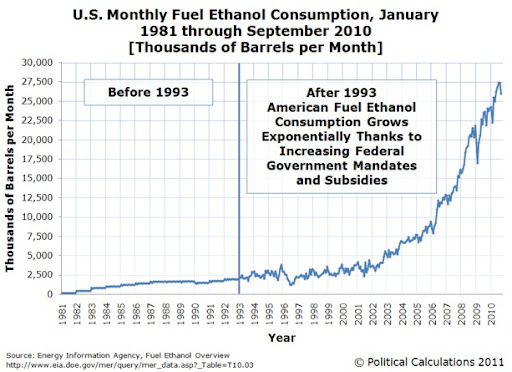 President Clinton is right that ethanol is a key to American energy security and we would welcome his support in advocating for the continued advancement and evolution of this industry to include a wide variety of feedstocks and technologies." Democratic presidential nominee Bill Clinton criticized Bush for making "the wrong choice" on ethanol. Clinton said he would "find a way" to meet environmentalists' concerns about increased use of the fuel. 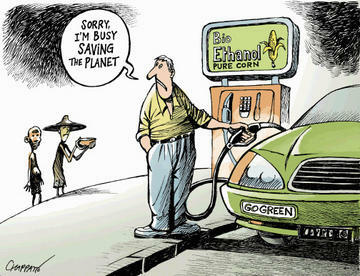 When farmers gaze across their next crop of corn, instead of feed for cattle they'll be seeing fuel - and dollar signs. On Thursday, President Bill Clinton delivered an enormous boost to Midwestern farmers with an order that will increase markets around the country for corn-based ethanol fuel.